Congratulations on your new puppy or kitten! We are so excited for you! The staff at Dupont Veterinary Clinic can’t wait to meet your new companion and help prepare you with the knowledge to keep your new puppy or kitten healthy and happy for years to come. There is so much to learn – vaccinations, tests, diet, spaying or neutering, socializing, conditioning, training, and best practices to keep them safe and healthy… It can certainly be daunting! But, do not fear! We are here to help! 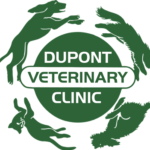 The doctors at Dupont Veterinary Clinic are experts in puppy and kitten care. When you come in for your initial visit they will take the time to answer every question you may have. We offer comprehensive puppy and kitten plans that will give you key information and will walk you through the initial tests and vaccinations. We utilize the latest vaccinations and vaccine protocols recommended in the veterinary community, so you can have peace of mind that your companion is only receiving protection for what they need. View Dupont Veterinary Clinic’s Puppy Packet and Kitten Packet for all of the essential information you will need to care for your pet!! Click this link for more information on adopting a pet and preparations for the new companion.